As promised, today I am reviewing one of the short stories from the anthology sitting on my bookshelf. 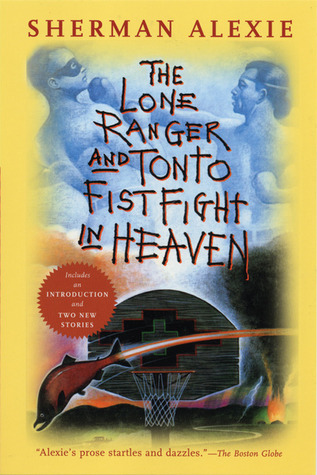 I chose The Lone Ranger and Tonto Fistfight in Heaven by Sherman Alexie for several reasons. First, I read Alexie’s novel, Reservation Blues when I was in college and loved it. Second, it was in a copy of his collection of short stories, which is a much smaller book to carry around than the anthology. And lastly, when I was looking through the anthology’s table of contents, this was one of the first things listed, since they sort the stories by author last name. Plus, just look at the title – The Lone Ranger and Tonto Fistfight in Heaven. Isn’t that the best title ever? The subject matter of the story itself is not quite so lighthearted. Alexie’s writing is always about life living as a Native American, living both on the reservation or off. In this story, the main character (who is unnamed) is dealing with a lot of anger. He is back living on the Spokane Indian Reservation after his girlfriend, a white kindergarten teacher in Seattle, broke up with him. This main character doesn’t seem to fit in anywhere. He tried living in Seattle, but he also quotes an old Indian poet in saying that “Indians can reside in the city, but they can never live there.” But he’s also different from the others on the reservation, since he did leave and go to college. The story is very brief, but also very powerful and probably resonates with a lot of people. It’s about trying to belong, or at least pretend to belong when you don’t seem to belong anywhere. The main character doesn’t belong with his girlfriend, but also doesn’t fit in with his family. He feels like an outsider whether he lives on the reservation or in the city. And one of the things I like about short stories is that things are not always resolved. In novels, we expect an ending, usually a happy one. In short stories, that isn’t always the case. At the end of this story, the main character doesn’t find himself or know what to do with his life. He’s still a work in progress, and still very unsure about what to do. Again, this is another thing I like about short stories – who hasn’t felt like this before? We’re all works in progress, trying to figure out where we fit into the grand scheme of life. So that’s my short story for the week! I’m glad this brought me back to reading Sherman Alexie’s work. One of his novels, The Absolutely True Diary of a Part-Time Indian, is on my TBR list (again, isn’t that title awesome!) and has been for a while. Go check out some of Alexie’s writing. You’ll be glad you did.